Water is the main composition of our body. The body is composed of 80% water. It is essential for proper digestion, proper blood circulation, nutrient absorption and chemical reactions in our body. It also helps remove toxins (acidic waste from the body). Drinking unfiltered water from tap is unsafe for us as it contains parasites, fluoride, germs and dioxins. Studies show that purified water is good for drinking for a short period of time. Cooking foods in purified water pulls the mineral such as calcium and magnesium out of them and lowers the nutrient value. Purified water is an active absorber and when it comes into contact with air it absorbs carbon dioxide, making it acidic. The more purified water a person drinks, the higher the body acidity becomes. The more mineral loss from the body due to cooking food in purified water can lead to osteoporosis, steoarthritis, hypothyroidism, coronary artery disease and high blood pressure. The absorption of carbon dioxide from air makes purified water acidic. Many metals are dissolved by purified water. Health care practitioners and scientist have been advocating the theory that ageing and disease is the result of acid waste products in the body and mainly the Acidic Water. The longer one drinks purified water, the more likely the development of mineral deficiencies and an acid state. Cancerous tissues are acidic, Healthy tissues are Alkaline. The ideal water for human body should be alkaline this requires the presence of minerals like magnesium and calcium. The best way to maintain health in a toxic environment like today is to drink Alkalized ion water. Alkalized water helps the body get rid of toxins (acids) and maintains the pH level of the body. Alkaline water is antioxidant rich water. Helps the body to get rid of toxins (acids). Helps maintain pH level of the body. Improves the Immune system of the body. Make cooked food taste better. Allow you to absorb nutrients more effectively. 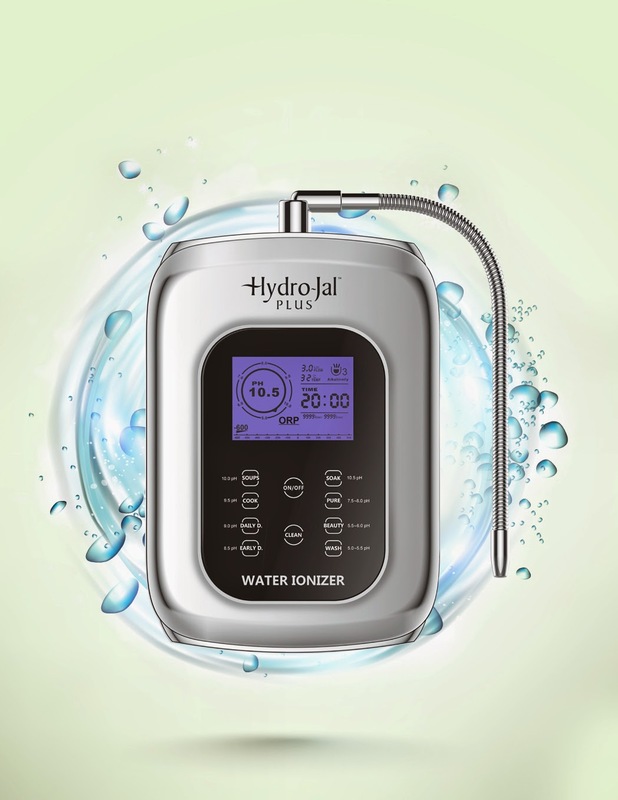 HydroJal Plus is world's most advanced, compact, stylish, and affordable alkaline water ionizer. Each and every part of HydroJal Plus fulfills all the global standards set by independent organizations in the areas of health, equipment safety, and environmental protection. Why HydroJal Plus Water Ionizer? More Hydrating than Tap Water: Delivers increased hydration and vital nutrients are better absorbed by the body. Ultra Filtered and Ultra Clean: The most advanced filtration system consisting of anti-bacterial filter with silver-impregnated activated carbon removes 99.9% chlorine, inorganic pollutants, heavy metals, microorganisms and dramatically improves the taste. Easy to Operate: HydroJal Plus comes with soft touch buttons on a large LCD touch screen display that shows pH and ORP value of the outgoing water, rate of water flow through the ionizer, temperature of the water, electrolysis status of the ionizer, cleaning status of the ionizer, total water output of the ionizer. Easy to Install: HydroJal Plus can be installed within minutes. It comes with a diverter kit that fits all standard kitchen faucets and you do not have to be an expert to complete the installation process. You can request a free HydroJal Plus product demo of at you place which includes testing of acidic level of your drinking water. Log on to their site http://www.hydrojalplus.com/ or call them at +91 2240694462 and request a free demo now!! !